Secondary steel making steps utilize transfer ladles and ladle metallurgy stations to further refine steel that has been processed in a BOF or EAF. A term often used is to produce "clean steel", which originally described a steel product with a low level of oxide and sulfide inclusions. The term now also includes demands for steels with low levels of phosphorus, hydrogen, nitrogen and even carbon. Ladle refining vessels range in sophistication from simple to quite involved. This relatively simple illustration of a transfer ladle heating station with argon stirring illustrates how Oxy-fuel systems can be applied. Another process completed in a transfer ladle is desulfurization. To remove sulfur from the liquid metal, it is necessary to use a sulfide-forming agent such as a calcium compound. Agents typically used to desulfur steel and achieve sulfur contents below 10 ppm are either calcium alloys like CaSi or low melting point synthetic slags containing aluminum. Due to the high oxidation potential in the BOF, little additional desulfurization occurs during the oxygen steel making process. When starting with a low sulfur content in iron, an increase in sulfur can be observed in BOF operations from scrap additions. Typically, the sulfur content after tapping is also around 0.010% (100 ppm) and a further lowering is made via ladle refining metallurgy in ladle refining stations. Although not currently in operation, AGA Gas participated in the ladle heating trial and is confident that this technology is viable for certain steel grades not overly sensitive to hydrogen pick-up. They also state it could be applied as a low-cost holder in instances where caster production interruptions occur (especially when vacuum degassing is available). AGA also points out that any resulting hydrogen pick-up can be effectively removed in the ladle refining station. Ladle refining stations, also referred to as Ladle Metallurgy Furnace (LMF) station, generally use an electric arc system to adjust (raise) the temperature of the heat. Some molten metal reheating, after final alloy additions are made, is usually required prior to transfer to the tundish and caster. A vacuum degassing ladle system can also be utilized to outgas (remove hydrogen) or decarburize molten steel. The range of refining and heating possibilities is shown below. Ladle refining equipment offers a number of options and benefits including desulfurization, homogenization of the melt, and the ability to fine-tune the chemical composition and then repeat this chemical composition control from heat to heat. The same options allow for adjustment of the casting temperature. If lower temperatures are necessary, it is carried out by adding well selected scrap until the optimum temperature is reached. Raising the temperature in the ladle refining station is usually completed with electric arcs (that operate similar to an EAF only lower power), induction, by an allotropic process (i.e. ; by adding aluminum and oxygen to the steel bath), or after the ladle has transferred the molten refined steel to the tundish. A graphic illustrating the typical location of these torches is shown below. Technical literature indicates that approximately 20 plasma torch tundish installations exist worldwide. Literature review also indicates one intriguing possibility for natural gas tundish heating. A "Zero Oxidation" system, meaning that no combustion gasses are in contact with the liquid metal, for tundish heating schematic is illustrated here. This newly developed Zero Oxidation system is reported to be installed at a continuous casting facility in Japan. The device is called an N2 jet heater and uses the principle of a storage type heat exchanger. A set of two heaters are used, each containing a regenerator; and it is possible to heat Nitrogen gas to 1,773°K (2,730°F). The high-temperature N2 then will be piped to the tundish and will maintain high furnace (and metal) temperature under non-oxidizing conditions. After the system was applied to the tundish heater, the rate of occurrence of inclusion-related defects in the quality of the solidified slab was reported as one-fifth to one-third of the past levels. If the system is successful, then this natural gas option could provide continuous caster operators a significant and credible approach to high capital cost electric tundish heating methods. Natural gas systems are already used for tundish drying (after refractory repair or reline) and heating before the initial heat is poured into the tundish. 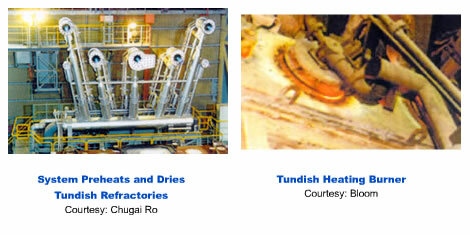 Examples of gas-fired tundish heating and drying systems are shown below.